LOPS researchers, engineers and technical staff work for observing and improving our understanding of the past and present state of the ocean: its motions (currents, waves, eddies ...), temperature, salinity. This covers all scales from the general ocean circulation and its variations on multi-decadal time scales, to ocean waves that can be only a few centimeters long, all the way through turbulence at all scales, and specific studies in the coastal ocean. 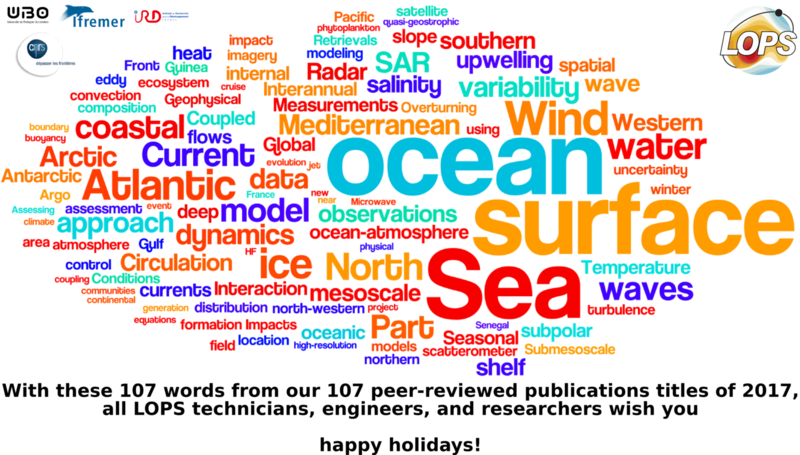 Work in organized in 4 teams (coastal ocean, ocean & climate, ocean scale interactions, satellites and air-sea interactions) with exchanges and common interactions, in particular along two cross-cutting axes: ocean data and the polar oceans. This work on the physics of oceans is connected to other displinary efforts in applied mathematics, biology, geography, engineering, and also the physics of other compartments of the Earth system (atmosphere, solid Earth ... ). This collaborative work takes place under the umbrellas of the IUEM and Ifremer, and many collaborative research projects.